(Nanowerk News) Pioneering research combining plant breeding and high-intensity x-rays is being used by scientists funded by the Biotechnology and Biological Sciences Research Council (BBSRC) to explore the possibility of developing wheat which could be used to make potentially life-saving mineral enriched flour. The research is highlighted in the latest issue of Business, the quarterly highlights magazine of BBSRC. Scientists from Rothamsted Research, an institute of BBSRC, are using high powered x-rays from the world famous Diamond Light Source, a third generation synchrotron in Oxfordshire to carry out fluorescence analysis in favour of traditional staining techniques to identify new wheat varieties with added health benefits. This rapid approach not only locates several different minerals simultaneously, but also provides information about their chemistry and digestibility. 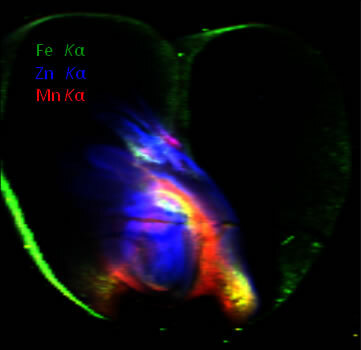 X-ray of a cross section of a wheat grain reveals zinc (blue), iron (green) and manganese (red). A wheat grain consists of bran (the outer layer), the germ (or embryo) and white flour (or starchy endosperm). Wheat bran and germ are rich in protein, fibre, oil, vitamins and minerals but the endosperm has little valuable mineral content meaning white flour is virtually devoid of minerals. Using an x-ray beam line, Neal exposes grains to microfocussed high intensity x-rays. As the x-rays encounter different minerals, characteristic fluorescence x-rays are emitted. Scanning across the energy range of fluorescent x-rays shows a great deal about the properties of the grains including where and how much of each mineral is present, and how each mineral is complexed within the various regions of the grain.